A 10-minute screening test to identify pre-school children who might be dyslexic has been developed by language experts at University College London. 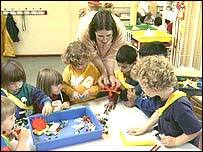 The test will be used by children from the age of three and a half upwards, says Professor Heather van der Lely. But Dr John Rack of Dyslexia Action urged caution about the risk of "false alarms" from short screening tests. 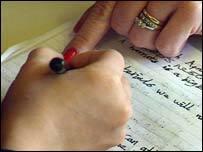 Dyslexia is a condition that can cause difficulty with reading, writing and spelling. The test has been developed by Professor van der Lely, who is director of the UCL Centre for Developmental Language Disorders and Cognitive Neuroscience. What makes this test different is that it can be carried out in only 10 minutes - and that it can be used before children are usually able to read, picking up any potential concerns before children have started full-time education. Professor van der Lely, speaking on BBC Radio 4's Today programme, said that the test, which asks a child to repeat sentences and re-tell a story, can help with early intervention. "Many children who have more severe language problems are not spotted until they're seven, eight or nine years of age, which is a huge cost for everybody," said Professor van der Lely. The test examines how children use language - with particular attention to "phonology", which is how sounds build up into words. "For the dyslexic part we're trying to look at the phonology, as we know that children who have problems with phonology are at risk for dyslexia. So we're trying to pick it up before the child even starts to read." However, head of assessment and research at Dyslexia Action Dr Rack urged caution about such screening tests. While welcoming any extra help for parents worried about their children, he said "a note of caution is needed". "A test such as this can only give an indication - it's a screening test and any test only taking 10 minutes will be subject to all kinds of technical difficulties over interpretation," said Dr Rack. "We do know from the history of similar screening tests that they can produce a number of false alarms and can miss more subtle difficulties." Professor van der Lely said the test had been used with 700 pupils and was found to be as reliable as tests which lasted 90 minutes.